Voice your opinion! Review Environmental Energies now. I don't know which I am more grateful - for the fact that I found this firm or the fact that now I know I can call on a company that is trustworthy and responsible. I wanted to have solar panels installed in my new home and contacted this company to get some more information. They were really patient and ready to answer to all of my questions. They handled everything professionally and quickly. I'm glad I chose them! 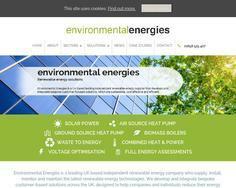 Is Environmental Energies your company?